A toast to my family with enemy’s skull! Or other way around? Three skulls made into cups by Cro-Magnons, who lived in England some 14,700 years ago, have become the earliest-known such find. The prehistoric goblets come from Gough's Cave in Cheddar Gorge, England. They have been fashioned from the skulls of two adults and one child, with a great degree of effort and craft. The facial and base bones have been removed and the edges carefully smoothed, resulting in crude but quite usable bowls or cups, paleontologist Silvia Bello of the Natural History Museum and colleagues report in PLoS ONE magazine. The containers have likely been made with a ceremonial goal in mind, the magazine says, and there was clear “determination to preserve the cranial vault as completely as possible”. The skulls are thought to have belonged to enemies of the tribe who made the cups, with the skulls being trophies. 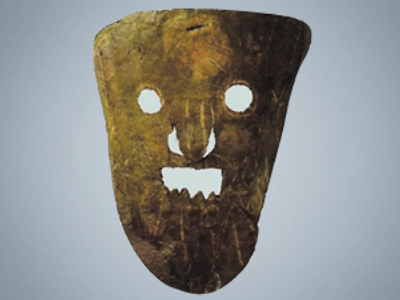 However, they could have been from fellow tribesmen and preserved as mementos. The question of what was served in them is as yet unanswered. It could have been anything from wine to blood, or even the brains of the slain enemies, as other human bones found on the site have been split open to access bone marrow, which clearly indicates cannibalism. 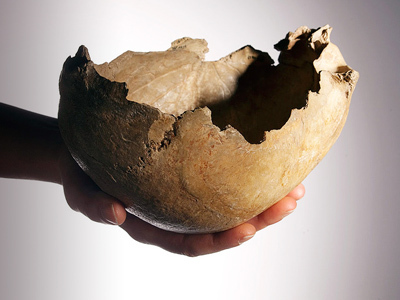 Human skulls have been and are still used as cups by a number of cultures. For instance, Ancient Greek historian Herodotus said the Scythians had a habit of drinking from the skulls of their enemies. The modern Aghori ascetics in India use skull caps for both drinking and as begging bowls.